Estate Planning is a topic that many people dislike to talk (or even think) about. That includes the writer of this blog post. However, Estate Planning is an essential element for personal finances and especially for creative types (like yours truly). I recently heard M.L. Buchman on the Creative Penn Podcast (highly recommended for authors) discussing his book, Estate Planning for Authors, and I bought a copy. Glad I did. Buchman has written an easy-to-follow guide on the basics of Estate Planning. He provides examples from Elvis Presley, Patricia Cornwell, Jane Austen, and Octavia Butler how the misuse of estate planning can affect a creative person’s heirs and legacy. Reading those examples was sobering and has given me a better understanding on how to protect a creative person’s intellectual property (IP). The last section of the book shows how an author should write a Final Letter. Buchman uses his Final Letter as a guide and gives a step-by-step process on what should that letter include. Estate Planning For Authors is highly recommended and a must for authors (or other creative types) to have in their libraries. It will be a book I read and re-read. 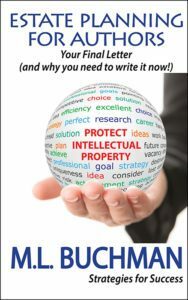 Intellectual Property (IP) is valuable (even if you have not made a lot of money as a writer) and having an Estate Plan is the most loving thing you can do for your heirs and legacy.